Detect High Levels of Mercury with this Water Test Kit. Contains a bottle of 50 test strips to check for high levels of mercury: <50, 50, 100, 200, 500, 1000 ppb (parts per billion). 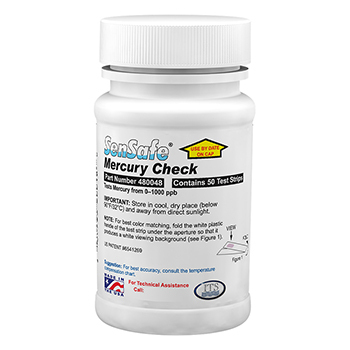 Result in 3 Minutes Mercury Check for water quality testing is a quick and easy method to test for high levels of Mercury ( Hg - free dissolved ). NOT FOR DRINKING WATER, HIGH MERCURY LEVELS! High concentration Mercury Water Test kit has no identified interferences. This test kit is not for an average home owner. If you want to detect levels of mercury in home water, look at Boris' Mercury Water Test for Drinking Water. This is not for the average home owner to use. There is no chart that tells you what is an acceptable level of mercury. I tested both well water and city water and got the same readings. Doubtful they were correct.I contacted the company for clarification and never heard back. Comment Reply: Thank you for the feedback. You are correct, this test is not for drinking water, it is used to detect high amounts of mercury. You can use our "Boris" mercury drinking water test to test your home water.